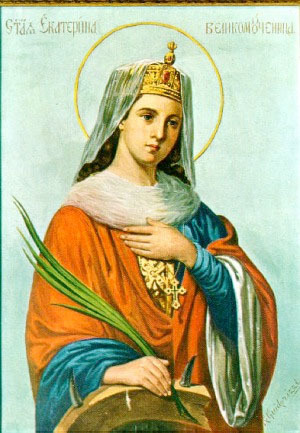 St. Catherine is believed to have been born in Alexandria of a noble family. She converted to Christianity through a vision, she denounced Maxentius for persecuting Christians. Fifty of her converts were then burned to death by Maxentius. St. Catherine was likewise condemned to death. She was put on a spiked wheel, and when the wheel broke, she was beheaded. She is venerated as the patroness of philosophers and preachers. St. Catherine's was one of the voices heard by St. Joan of Arc.